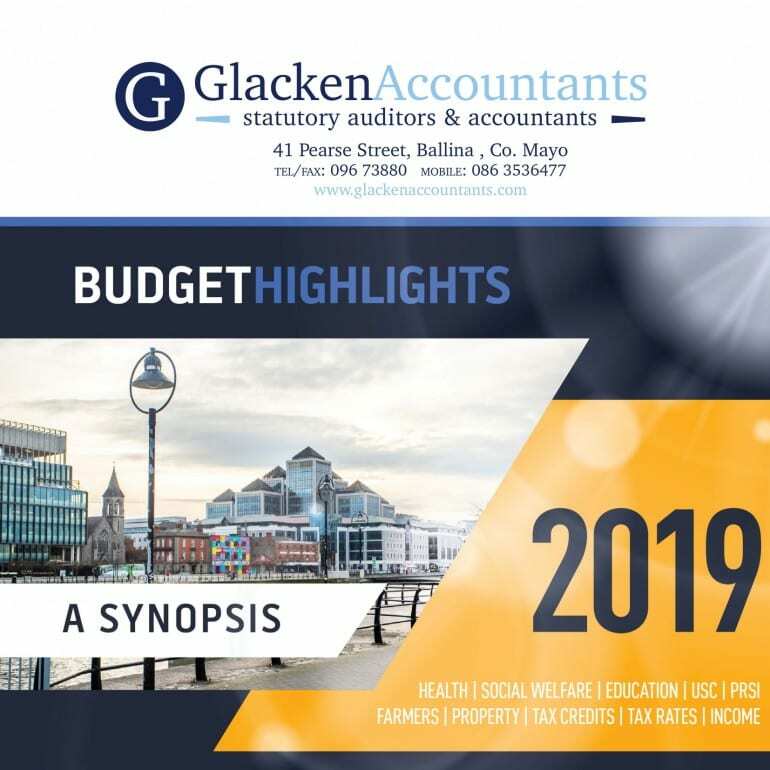 Budget 2019 was presented yesterday and was the first Budget since 2007 to be ‘balanced’. There were no big winners from yesterday’s announcements. Increases in weekly Social Welfare payments, tobacco products and Betting Tax were included. Perhaps, of concern to those in the hospitality and tourism sector was the increase of VAT Rate from 9% to 13.5%. Along with an increase in the minimum wage to €9.80 per hour some small businesses may have to reflect on their pricing and staffing levels. 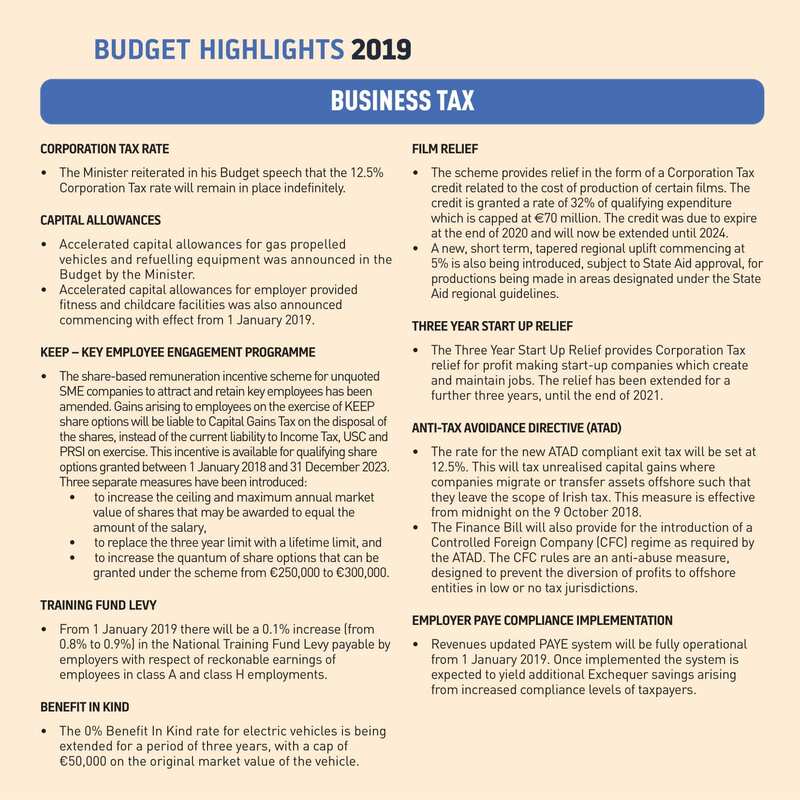 Tax rates in all other taxes remained the same and under the Income Tax regime there was an increase of €750 in the threshold for those paying tax at the 20% rate. The USC rate of 4.75% was reduced to 4.5%. The threshold for Employers PRSI was also increased to €386 per week. Under Capital Acquisitions Tax those who fall into the Class A threshold saw this band increased by €10,000 to €320,000 which is a small reflection on increasing property prices. There was no reduction on the rate of Inheritance Tax or Capital Gains Tax. Start up companies will see an extension of the relief from corporation tax being extended by another 3 years to the end of 2021. For farmers stock relief has been extended by 3 years and Income Averaging has also been extended to cover non-farm income. There were announcements of investment in Housing, Health, Education, Justice, all of which remain to be seen in 2019.